Another year, another Beijing winter. 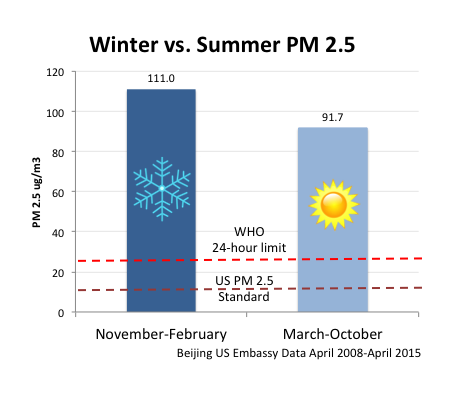 As winter arrives to Beijing, I got to wondering: how much worse is winter air? 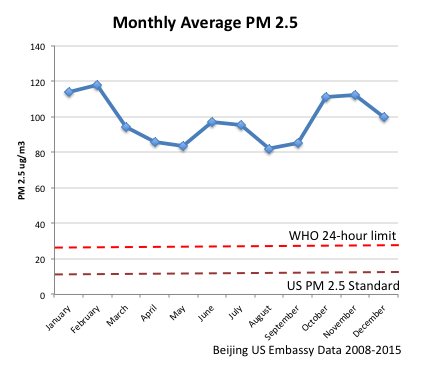 To get to the bottom of it, I analyzed the last seven years of US Embassy PM 2.5 data. I found that the capital’s air has averaged 111 micrograms in the winter versus 92 micrograms for the rest of the year. Just how bad is that? The WHO 24-hour PM 2.5 limit is 25 micrograms. That means Beijing’s summers average three times the limit, and winters average over four times limit. Do Chinese New Year Fireworks Pollute Indoor Air?